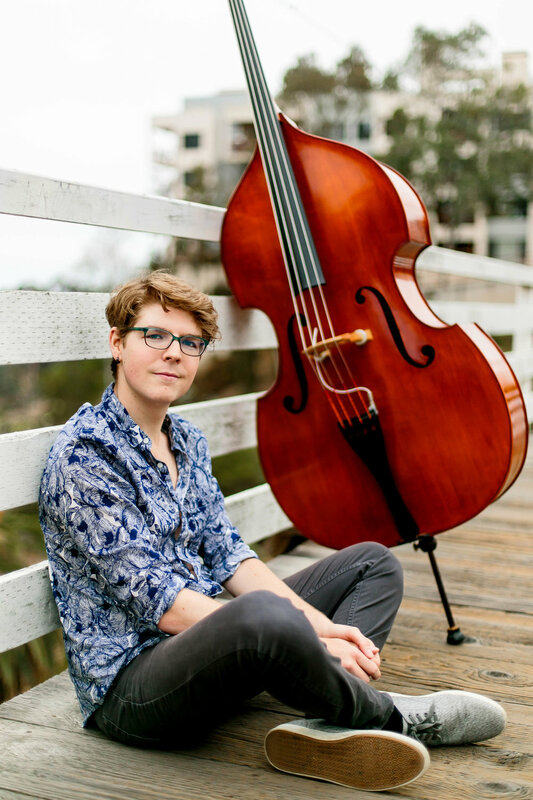 A rising talent in San Diego, bassist and composer Sean Hicke quickly found his place in the local jazz scene, frequently playing with several of San Diego’s best and most imaginative musicians. Sean’s bass playing is informed by a musical upbringing that included punk, funk, jazz, musical theater, and classical music. His years of study on saxophone, clarinet, electric bass, and voice give him a melodic approach and a holistic perspective of music that he takes with him every time he plays the upright bass. An avid composer, it did not take long for Sean to develop a unique compositional voice. His original music builds upon the tradition of creative improvisatory music and is characterized by the juxtaposition of folk-like melodies with adventurous harmonic soundscapes. Sean recently graduated with a bachelor’s degree in jazz studies from San Diego State University. He maintains a small private studio and can be found playing at many of San Diego’s beloved jazz venues every week. His debut album, Sunflower Sutra, was released on January 6, 2019.